(Nanowerk News) Kenji Ohmori (Institute for Molecular Science, National Institutes of Natural Sciences, Japan) has collaborated with Matthias Weidemüller (University of Heidelberg), Guido Pupillo (University of Strasbourg), Claudiu Genes (University of Innsbruck) and their coworkers to develop the world's fastest simulator that can simulate quantum mechanical dynamics of a large number of particles interacting with each other within one billionths of a second ("Direct observation of ultrafast many-body electron dynamics in an ultracold Rydberg gas"). The dynamics of many electrons interacting with each other governs a variety of important physical and chemical phenomena such as superconductivity, magnetism, and chemical reactions. An ensemble of many particles thus interacting with each other is referred to as a "strongly correlated system". Understanding the properties of strongly correlated systems is thus one of the central goals of modern sciences. It is extremely difficult, however, to predict theoretically the properties of a strongly correlated system even if one uses the post-K supercomputer, which is one of the world's fastest supercomputers planned to be completed by the year 2020 in a national project of Japan. For example, the post-K cannot exactly calculate even the energy, which is the most basic property of matter, when the number of particles in the system is more than 30. Instead of calculating with a classical computer such as the post-K, an alternative concept has been proposed and referred to as a "quantum simulator", in which quantum mechanical particles such as atoms are assembled into an artificial strongly correlated system whose properties are known and controllable. The latter is then used to simulate and understand the properties of a different strongly correlated system, whose properties are not known. Huge investment to the development of quantum simulators has therefore been started recently in national projects of various countries including US, EU, and China. The team has developed a completely new quantum simulator that can simulate the dynamics of a strongly correlated system of more than 40 atoms within one billionths of a second. 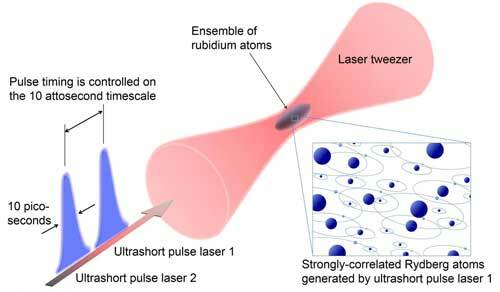 This has been realized by introducing a novel approach in which an ultrashort laser pulse whose pulse-width is only 100 billionths of a second is employed to control a high-density ensemble of atoms cooled down to temperatures close to absolute zero. Furthermore they have succeeded in simulating the motion of electrons of this strongly correlated system that is modulated by changing the strength of interactions among many atoms in the ensemble.